As Saturday was declared the lovely Lisa's unbirthday it was time for another research trip. Armed with a small pamphlet detailing some local history we set off for Wapping. When I hear Wapping mentioned the history I normally think of is the printers' strike, but I didn't think that was much use when plotting a pub crawl. Fortunately for us the pamphlet told tales of pirates, press gangs and more importantly pubs. Our first port of call was the Town of Ramsgate. 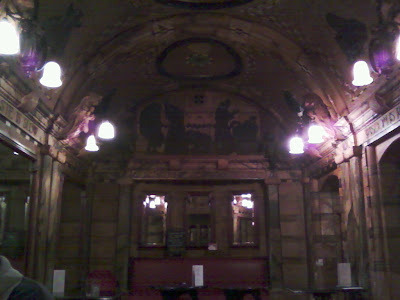 Apparently this pub was previously called the Red Cow after a particular red-headed bar maid! We sat out the back by the river drinking a refreshing pint of Wye Valley HPA (4% ABV) as the sun came out. A good way to start the day. 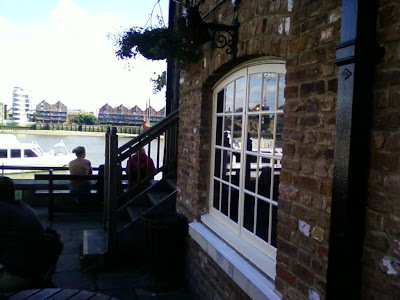 Next stop was the The Captain Kidd pub, named after the pirate who was hanged nearby. It's a Sam Smith's pub so I passed on the single cask beer and went for a wheat beer. Sitting by the river drinking beer has a lot to recommend it but having more than one pint of keg beer on a pub crawl would be carelessness so it was soon time to move on again. We headed sarf of the river over tower bridge, which has a great view of an old Courage brewery (now flats). The Dean Swift was our destination. 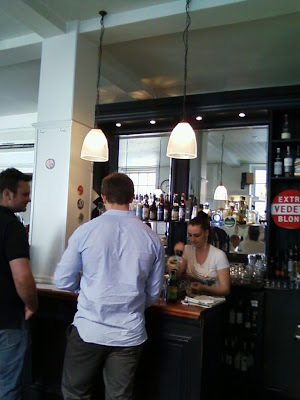 A much more modern affair, it looked like one of these new fangled craft beer bars to me. Otley Columbo was on one of the hand pumps, surely the beer to raise a glass to Peter Falk with? Though having said that it wasn't entirely to my taste, some of these American hops are a bit harsh. 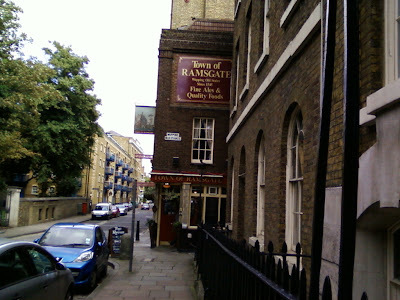 It was time for food next and the lovely Lisa wanted to get to her favourite pub, the Blackfriars. "As you wish" I said and we hot footed it down there. Prices were much more reasonable here than in the previous pubs, which was nice. Pie and mash soon had us ready for some more cold beer action so we washed our dinner down with pints of Tribute. And quite possibly some other beers too but the unbirthday celebrating was getting the better of us by then. On our last trip to the Lakes the lovely Lisa and I managed to track down Thürstein pilsner. With a name like that, complete with a heavy metal umlaut, we had to give it a go, despite the natural aversion to lager we share with all discerning drinkers. 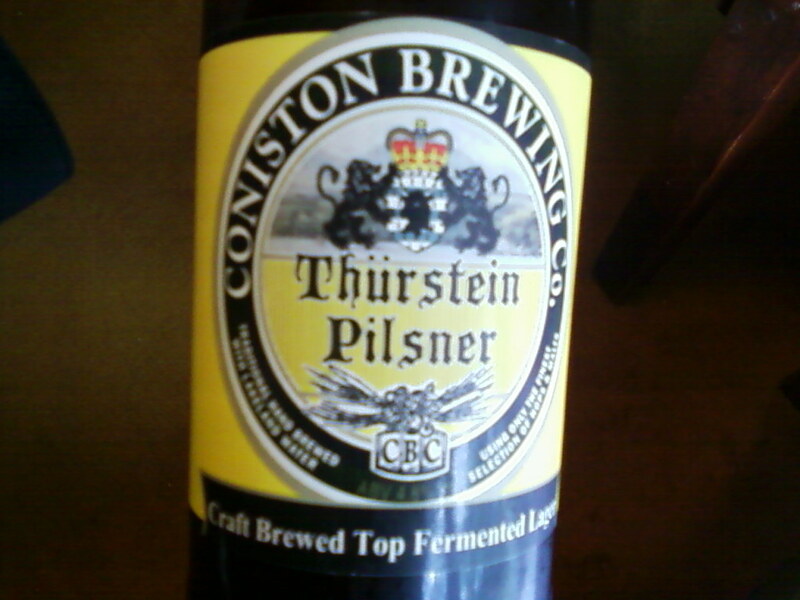 The beer's described as a "pilsner style top fermented lager" which got me thinking. Nowadays the beer kingdom is generally divided into the phyla of ale and lager depending on whether it is made with top/warm fermenting yeast (Saccharomyces cerevisiae) or bottom/cold fermenting yeast (Saccharomyces pastorianus) respectively. This difference contributes greatly to ales having their delicious fruity flavour and lagers having their boring bland lack of flavour. But the classification wasn't always this way, as originally ale was the term for unhopped fermented grain drinks, beer was hopped fermented grain drinks and lager didn't get a look in. As I've said before I'm not entirely happy with how beers are currently classified, but I'm no Linnaeus so I haven't come up with my own grand scheme yet. However, I'm not convinced the best way to classify beers is solely by the yeast species they're fermented with and it seems the Coniston Brewing Company agree with me. There are ale yeasts out there that give a 'neutral' flavour (i.e. they contribute nothing to it) and a number of breweries make 'lagers' with them. As the main flavour I get from lager tends to be the sulphury/vegetable flavour of DMS ( Dimethyl Sulphide - which ultimately comes from the very lightly kilned malt used to make most lagers), I think the malt makes a large contribution to whether I would recognise something as a lager or not. Fortunately Thürstein pilsner doesn't taste of vegetables, it's a refreshing, easy drinking beer flavoured with posh German hops. I'll leave it to the style police to decide whether it's a pilsner or not. After noted beer historian Pete Brown was on Radio 4 talking about Russian Imperial Stout anti-alcohol stuff soon followed. Dr Aric Sigman was calling for a total ban on alcohol to children under 15, as it meant they were less like likely to binge drink in future life. He backed this up by saying this was based on a survey not published in a medical journal. I can't see how not being published in a medical journal is supposed to make something more authoritative, but I couldn't be bothered to look into his figures. When not writing books on beer history Pete Brown has done an excellent job of demolishing dubious anti-alcohol arguments and to be honest, I don't care anyway. As binge drinking for an adult male is defined as having three to four pints in a session it doesn't sound excessive to me, it sounds normal. So that makes me a binge drinker. And do you know what? I really enjoy it. I've had some of my best times when out boozing. As far as I'm concerned it would be good for future generations to have the same enjoyment drinking as I have had. It may not be good for your health. It may have an element of risk. But so bloody what. Life has a 100% mortality rate. No matter what you do you'll still die, so you might as well enjoy yourself before you pop your clogs. So tonight I'm going down the pub for a session. Some of my family visited the brewery in the week. Though on the face of it this seemed an excellent opportunity to continue my niece's indoctrination it didn't really go to plan and Phoebe looked decidedly unimpressed. Beer historian Pete Brown and Master Brewer Tim O'Rourke were on the radio this morning talking about Imperial Russian Stout. I was slightly surprised to hear Pete Brown described as a beer historian, and even more surprised that The Great Baltic Adventure was being billed as a trade mission, but it's all good fun. My own version of Tim O'Rourkes stout recipe will be making its public debut at the SIBA SE beer competition in Tonbridge in mid July. There was an item on The Beer Academy and beer sommeliers on the radio today. Julian Herrington, Simon Jackson and noted beer expert Melissa Cole were all on it, and in a change from beer blogs both 'craft beer' and CAMRA are talked about positively. We went to Devon for a beer festival at the weekend. The Kingfisher in Colyton was having its first beer festival with 12 ales on. Not something I'd normally travel miles for, but The Kingfisher is the local of the lovely Lisa's older sister and it's nice to visit. As the weather was hot the beers stillaged in the bar were a tad warm, despite their cooling jackets. 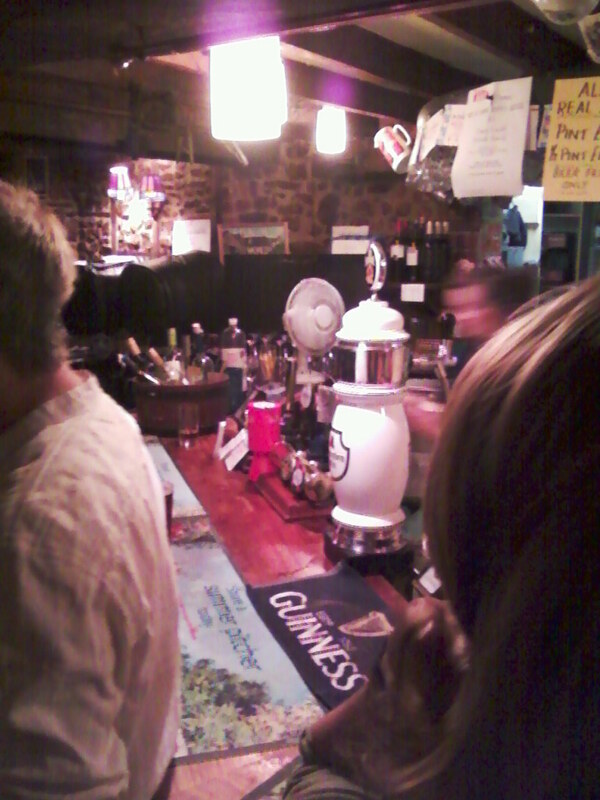 Fortunately there were four more on hand pump drawn form the cellar and the Sharp's Atlantic IPA was on fine form. The bitterness and sweetness were nicely balanced and the hop flavour really came through. I had a few of these. We had a great night in a great pub and hopefully we'll be back again soon. "The Session" is one of the many things in the beer blogging world that I didn't understand. A spate of blogs on the same subject would appear on the same day but it seemed to me to be missing the point. Surely beer blogging is all about putting down your own self indulgent ramblings? And isn't a session something that takes place in the pub? Then one was announced that got me pondering so I've decided to join in. "Beer Collectables and Breweriana" is the theme. Nope, don't have any of that I thought. Various bits from beer festival tombolas, things from the goodies bag given out at the Fuller's Fine Ale club do I suppose, but nothing that really counts as collectable or breweriana. Then I remember I do have something. The one glass in my cupboard I never use: a glass I inherited from my late father. 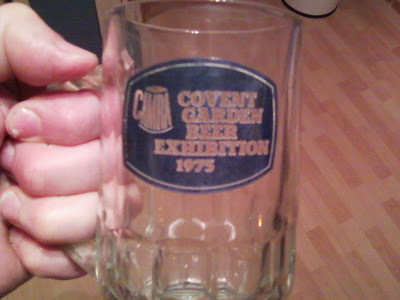 It's from Covent Garden beer festival in 1975, CAMRA's first national beer festival. 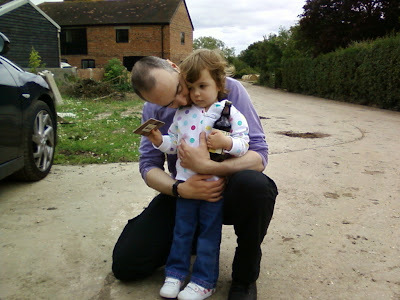 I am a second generation beer bore, which I suspect makes me a bit of a rarity amongst beer bloggers. Some people think there is a beer revolution taking place in Britain now, which seems to be a small number of elitists dedicated to making strong hoppy beer available to snobs. But back when I were a lad my dad was fighting a real beer revolution - a mass movement of people dedicated to making decent beer available to the masses. Now there's a revolution I can drink to! This month's session is hosted by All Over Beer. I'm going to another 'Meet the brewer' evening tomorrow (2.6.11), only this time I'm the brewer. I'll be at the Anchor in Sevenoaks for 8pm. If you can't get enough of my online ramblings here's your chance to hear me ramble on in person.